Wash and hull all the strawberries. Puree part of the strawberries in a blender. Halve remaining strawberries and set aside for serving. Juice lemons into a jug. Pour in sugar and stir to until fully dissolved. Add ice to a large pitcher. 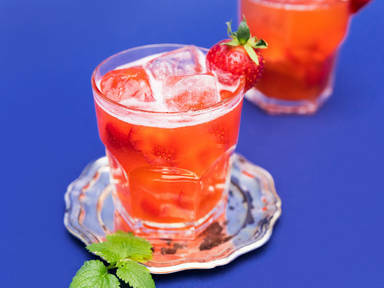 Place sliced strawberries in the pitcher and lemon balm leaves, if using. Pour in lemon juice, soda water, and strawberry puree. Stir well to ensure sugar is fully dissolved. Enjoy!